In a televised address ahead of his trip to Texas, the president called border crossings a "humanitarian crisis." But Trump didn't declare an emergency on the U.S.-Mexico border as the weeks-long partial government shutdown continues amid his stalemate with Congress. After claiming that illegal immigration disproportionately affects black and Hispanic Americans and fuels smugglers' abuse of women and children, President Donald Trump on Tuesday urged federal lawmakers to see his way on border security and fund his long-promised wall. His speech, which came days before a planned trip to the Texas-Mexico border, unsurprisingly drew immediate ire from Democrats in the state's Congressional delegation. "In the president's remarks, there were falsehoods & inaccurate statistics," U.S. Rep. Eddie Bernice Johnson, D-Dallas, tweeted shortly after the televised address. "We heard nothing new, nothing that will endure. What will endure is our national motto – that out of many, we are one." The president Tuesday again made the case for his signature campaign promise – a wall on the southern border that would cost taxpayers more than $5 billion. But he added that, “at the request of Democrats” he was willing to settle for a steel barrier instead of a concrete structure. “This barrier is absolutely critical to border security,” the president said, adding that the structure would be paid for, in part, through the new trade deal with Mexico and Canada. That deal has yet to be ratified by Congress and analysts have noted that even if it is approved by lawmakers, the trade pact known as the USMCA would not fund the wall’s construction. The president’s address came in the midst of a weeks-long partial government shutdown that has hamstrung about 25 percent of the federal workforce, who are working without pay. The shuttering of government offices came after U.S. House and Senate Democrats refused to fund part of the president’s wall during last December’s budget negotiations. 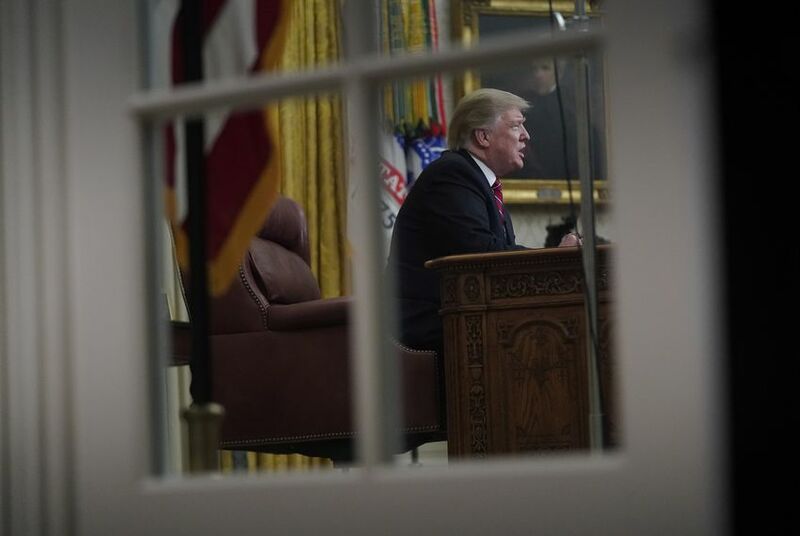 What the president didn’t do on Tuesday is double down on an idea that he’d floated publicly in recent days: declaring a national emergency and ordering the U.S. military to build the wall. That idea met resistance from both parties, including the ranking member on the U.S. House Armed Services Committee, Texas Congressman Mac Thornberry, who told the Washington Post that he wouldn’t support dipping into the Pentagon’s budget to pay for a border wall. And U.S. Rep. Joaquin Castro, D-San Antonio, said this week that such a move would be a “profoundly inappropriate” circumvention of the nation’s legislative branch. During his roughly nine-minute speech, the president also remarked on the ills caused by the flow of illegal drugs into the country. He also likely angered immigrant rights groups and their supporters by listing crimes allegedly committed by undocumented immigrants, including the recent killing of a California police officer the day after Christmas. “The life of an American hero was stolen by someone who had no right to be in our country,” Trump said. Republican Texas Lt. Gov. Dan Patrick missed the first day of the legislative session Tuesday because he was "working with the president's team" on the televised address. He will join Trump on a Thursday visit to McAllen, where the president is expected to again make his case for the barrier. McAllen Mayor Jim Darling said on Tuesday he was concerned the president would try to paint his city as a lawless swath of America. But he reiterated that the city and the people that live there are used to the mischaracterization of the Texas-Mexico border. Darling said his city has remained safe for years, even as it has become ground zero for the nation’s immigration imbroglios and the place where an influx of Central American asylum seekers cross into America. Democrats and immigrants rights groups wasted no time in challenging the president’s claims made Tuesday. In a statement, Lorella Praeli, the deputy political director at the American Civil Liberties Union, said the crisis at the border was of the administration’s own making. “It's manufactured security emergency isn’t credible," Praeli said. Though he was uncharacteristically subdued on Tuesday, the president could still widen the gap that currently exists between his office and Democrats during his Texas visit this week, according to Mark P. Jones, a political scientist at Rice University. “If he starts using more inflammatory rhetoric and starts using statistics and facts that are questionable, then he could harden the Democrats’ positions and make them less likely to compromise,” Jones said. Jones added that as the shutdown drags on, the potential for long-lasting damage to the president and his supporters grows. Emma Platoff contributed to this report. Disclosure: Rice University has been a financial supporter of The Texas Tribune, a nonprofit, nonpartisan news organization that is funded in part by donations from members, foundations and corporate sponsors. Financial supporters play no role in the Tribune's journalism. Find a complete list of them here.